Jerusalem (AFP) - Israeli police on Sunday began erecting a wall in east Jerusalem to protect a Jewish neighbourhood subject to firebomb and stone attacks launched from an adjacent Palestinian village. The wall would effectively divide Palestinian Jabel Mukaber and Jewish Armon Hanatziv, raising criticism among the government's opposition, which considered the move a de facto division of Jerusalem. As of Sunday, police had placed six slabs below Jabel Mukaber, each about 2.5 metres (yards) high and two metres long. Black lettering in Hebrew at the bottom of the slabs read "temporary mobile police barrier". The municipality said the wall would eventually cover a 300-metre strip, stressing it would not be peripheral and it was being placed where "there is a history of stone and firebomb throwing at Jewish homes and cars". Jabel Mukaber has been a hotspot in the recent wave of violence in which 42 Palestinians and seven Israelis have been killed, raising fears of a full-blown Palestinian uprising grew. Three residents of the village had killed three Israelis in two separate attacks in Jerusalem on Tuesday before being killed by security forces. On Saturday, a 16-year-old Palestinian was shot dead by police after attempting to stab border police at a checkpoint near Jabel Mukaber. 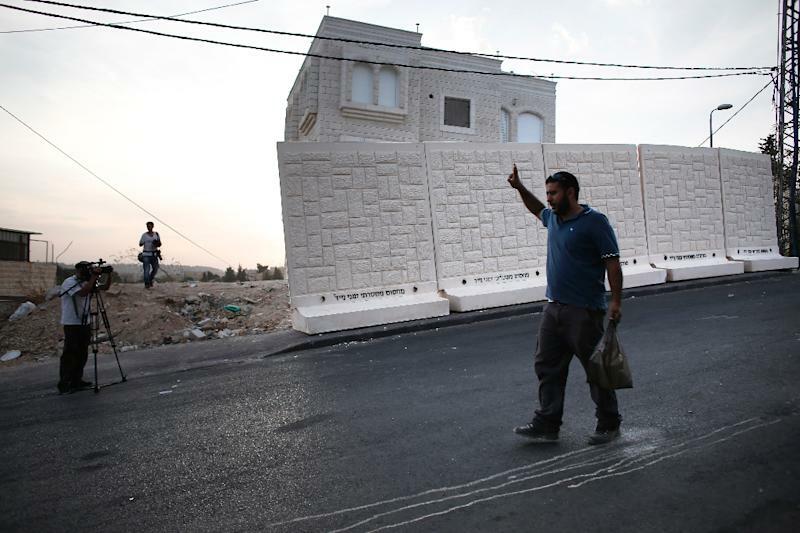 The new wall will join a series of checkpoints set up in recent days at the exits of some of the Palestinian sectors of east Jerusalem, including Jabel Mukaber. The Zionist Union, the centre-left party which leads the opposition to Prime Minister Benjamin Netanyahu's coalition, criticised the move. "Netanyahu officially divided Jerusalem today," it said in a statement. "Netanyahu has lost the ability to keep the safety of Israel's citizens and Jerusalem's unity." Israel regards Jerusalem -- which it has fully controlled since winning the 1967 Six-Day War -- as its historic and undivided capital. Palestinians, however, see much of the city as occupied territory and want the capital of a future independent state to be located there.